My name is Saijai Chaiyawoot, 31 years old, from Thailand. Now I’m studying at Nihongo Center. I really enjoy studying here because I got many international friends. The atmosphere of class so fun and teaching styles from institutors are so easy to understand. It has been three months so far I’m studying here, I really improved about reading, the writing and for sure conversation in daily life. Now I don’t need to be shy anymore to talk with store’ s clerks when I want to buy something from the convenient store. Hello, my name is Muftazar and I am from Indonesia. I have been in Japan for about 8 months. I just passed the JLPT N3 and I felt I did well. I really feel I progressed since I started, especially on conversational skills. Teachers always prepare theme’s discussion, and they guide us while discussing. There are so many discussion, essay and “Kanji” test that make us progress. 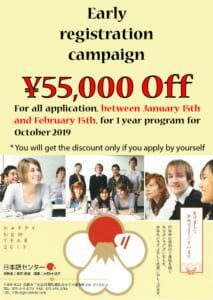 Nihongo Center wish you a happy new year. The class started again on January 15th and all the students were kind of happy to come back to the school to meet their mates and get back to their studies. They could also fully enjoyed their holiday. Some went back home for Christmas and the near year, some visited other parts of Japan, and others stayed in Kyoto to enjoy the year-end celebration and to their part-time job. We also started an early registration campaign from January 15th. 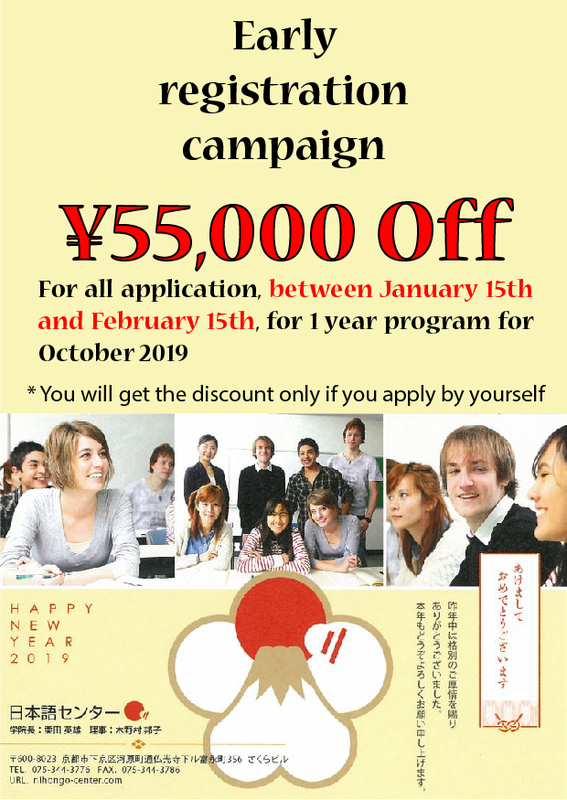 It will end on February 15th and is recommended to students willing to apply for a 1-year program with a student visa for October 2019 term. Be sure to check the conditions with us by contacting us. It is no longer possible to apply for a student visa for April 2019. However, you can still apply for 20 weeks or 1 year until February 22nd if you are holding any other visa which allows you to stay in Japan.